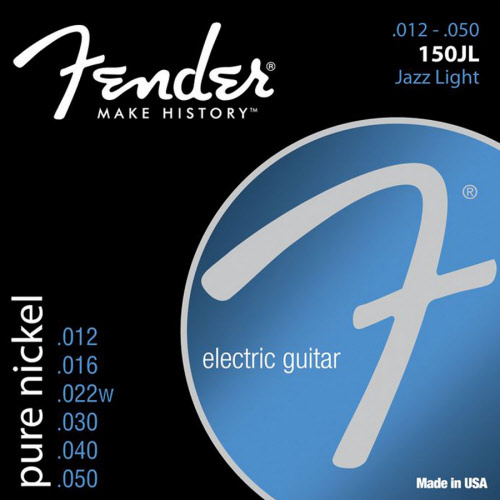 We sell the series 150S, 250S, and Super Bullets for electric guitars. Fender string set for electric guitars. Material: pure nickel. Version: Extra Light. Sizes: 009-011-015-024-032-040. Now from € 8,95 for € 6,45. Fender string set for electric guitars. Material: pure nickel. Version: Light. Sizes: 009-011-016-024-032-042. Now from € 9,50 for € 6,75. Fender string set for electric guitars. Material: pure nickel. Version: Regular. Sizes: 010-013-017-026-036-046. Now from € 8,95 for € 6,45. Fender string set for electric guitars. Material: pure nickel. Version: Medium. Sizes: 011-014-018-025-038-048. Now from € 8,95 for € 6,45. Fender string set for electric guitars. Material: pure nickel. Version: Jazz Light. Sizes: 012-016-022-030-040-050. Now from € 8,95 for € 6,45. Fender string set for electric guitars. Material: nickel roundwound. Version: Extra Light. Sizes: 008-011-014-021w-030-038. Now from € 8,95 for € 6,45. Fender string set for electric guitars. Material: nickel roundwound. Version: Light. Sizes: 009-011-016-024-032-042. Now from € 8,95 for € 6,45. Fender string set for electric guitars. Material: nickel roundwound. Version: Regular Light. Sizes: 009-011-016-026-036-046. Now from € 8,95 for € 6,45. Fender string set for electric guitars. Material: nickel roundwound. Version: Regular. Sizes: 010-013-017-026-036-046. Now from € 8,95 for € 6,45. Fender string set for electric guitars. Material: nickel roundwound. Version: Regular Top Heavy Bottom. Sizes: 010-013-017-032-042-052. Now from € 8,95 for € 6,45. Fender string set for electric guitars. Material: nickel roundwound. Version: Medium. Sizes: 011-014-018-025-038-048. Now from € 8,95 for € 6,45. Fender string set for electric guitars. Material: nickel roundwound. Version: Heavy. Sizes: 012-016-024-032-042-052. Now from € 8,95 for € 6,45. Fender string set for electric guitars. Material: nickel roundwound. Version: Jazz Medium. Sizes: 013-017-026-036-046-056. Now from € 8,95 for € 6,75. 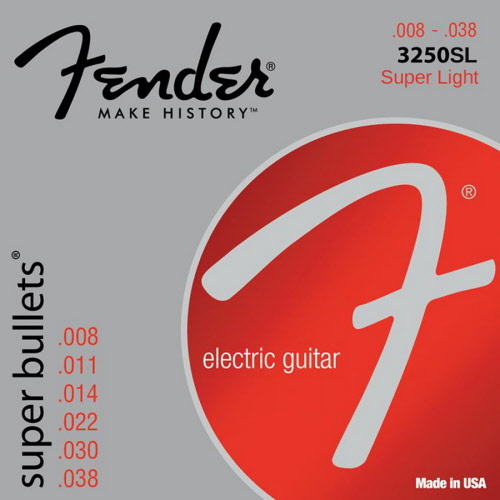 Fender string set for electric guitars. Material: nickel roundwound. Version: Light. Sizes: 009-011-016-024-032-042. Now from € 9,95 for € 7,50. Fender string set for electric guitars. Material: nickel roundwound. Version: Super Light. Sizes: 008-011-014-022-030-038. Now from € 9,95 for € 7,50. Fender string set for electric guitars. Material: nickel roundwound. Version: Light Top Regular Bottom. Sizes: 009-011-016-026-036-046. Now from € 9,95 for € 7,50. Fender string set for electric guitars. Material: nickel roundwound. Version: Regular. Sizes: 010-013-017-026-036-046. Now from € 9,95 for € 7,50. Fender string set for electric guitars. Material: nickel roundwound. Version: Regular Top Heavy Bottom. Sizes: 010-013-017-032-042-052. Now from € 9,95 for € 7,50. Fender string set for electric guitars. Material: nickel roundwound. Version: Medium. Sizes: 011-014-018-025-038-048. Now from € 9,95 for € 7,50. Fender string set for electric guitars. Material: nickel roundwound. Version: Heavy. Sizes: 012-016-024-032-042-052. Now from € 9,95 for € 7,50.